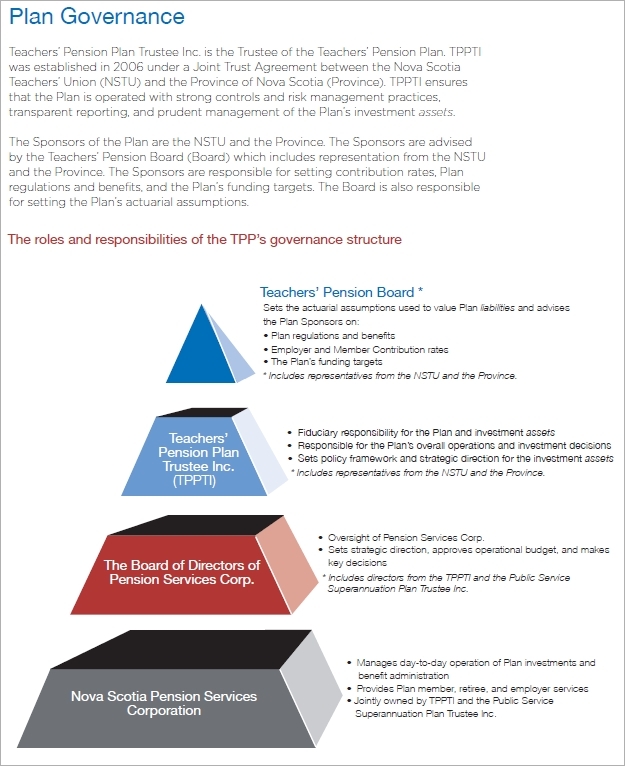 The Nova Scotia Teachers’ Pension Plan (TPP) is one of the largest public-sector pension plans in the Province. The TPP is a registered defined benefit pension plan that offers its members a lifetime pension benefit when they retire. The TPP was created by an act of the Legislative Assembly in 1949. Its membership includes all licensed teachers employed in the public school system, as well as the Atlantic Provinces Special Education Authority, the Nova Scotia Teachers’ Union (NSTU), and most instructional staff at the Nova Scotia Community College. Teachers’ Pension Plan Trustee Inc. (TPPTI) is the trustee of TPP. TPPTI was established in 2006 under a joint trust agreement between the NSTU and the Province of Nova Scotia. TPPTI has the fiduciary responsibility for the TPP, is responsible for its operations and manages its investment assets. Under the direction of TPPTI, Nova Scotia Pension Services Corporation (NSPSC) administers the pension benefits and investment assets of the TPP. NSPSC also provides member and employer pension services. The chart below highlights TPP’s governance structure and the respective roles and responsibilities of the key entities.